Impulse had the feel of a Harlequin romance novel. It should be titled something like The Greek Billionaire's Summer Fling. I don't know, it just felt like that kind of story. I liked Rebecca and Stephen but at a few different points I wanted to hit Rebecca. I felt like if she was so smart she should have been able to put a few more things together and realize that Stephen was more than what she believed him to be, but *shrug* such is the case with romances. I liked Temptation a little bit more. Eden and Chase were really great. These two felt more like the Nora Robert's characters that I love. They fight each other and themselves before finally admitting they care for each other. I prefer a battle to the female running away. I really like that Eden goes full steam ahead in her new life and embraces the challenges of working/running a summer camp. 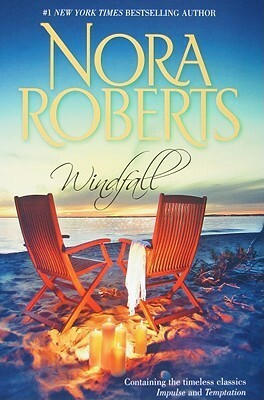 Sign into Goodreads to see if any of your friends have read Windfall.